Our annual Legendary Bingo fundraiser is coming up on Thursday, May 25! 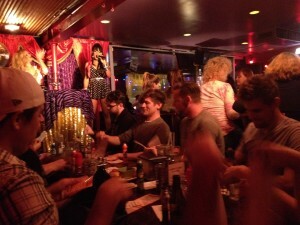 Join us at Hamburger Mary’s in Weho for 10 of the rowdiest, raunchiest games of bingo ever played. Each winner will receive a fabulous prize package courtesy of our super supporters (full list here), and a good time is always had by all at this notoriously loud and full-of-laughter event. Click here to RSVP on Facebook and join the fun! Dance with Dancescape THIS FRIDAY! Join us at The Sweat Spot to kick off your weekend with a diverse night of Dance! The evening begins at 7 pm with Kavita Rao, Artistic Director of Karmagraphy, who will lead a Bollywood fusion glass sure to get your heart rate up and put a smile on your face. Juliette Irons will teach a contemporary class at 8 pm, giving you all the feels. End your night with Nat at 9 to move and groove in her signature hip-hop style. Read more about our ingenious instructors and check class pricing here. All proceeds benefit Cheshire Moon & arts in schools! We are excited to welcome spring with several family friendly, (always!) arts inspired events. Click here to read our latest newsletter and get details on everything from the Grand Arts Festival to Dance with Dancescape night!